You guys, I popped the question! No, I literally POPPED the question. Last weekend I dedicated an entire day to getting my MOH and bridesmaids situation, well, situated. After almost a year of engagement, I figured it was time to lock in the ladies that would be standing by my side. Better late than never? When Pinterest-ing for ideas, I came across this balloon popping one that I absolutely loved. The listing was available for purchase through Etsy, but I decided to take matters into my own hands and have myself a Crafturday. Your bridesmaid will open a box containing a balloon with a tag that says “Pop Me” on it. Once popped, confetti and petals will fly, along with a notecard asking them to stand by your side on your big day. How cute, right? Petals – this was an extra addition, and totally not required. I originally couldn’t find the confetti I wanted at Party City so I grabbed these. When I did find the confetti, my debit card and I decided we couldn’t part with the white and gold petals. Oops. Write out your notecards asking the obvious question. I kept mine short and sweet. There’s no right or wrong way to ask this question, so ask it how you want to. It’s worth noting that “Bridesmaid Or Nah?” does have a 100% success rate and I now have three bridesmaids and one MOH that will be standing by my side next year. Create and decorate your “Pop Me” & “Name” labels. I decorated each one differently, because I liked the variety. Also, I didn’t think I could make each one look the exact same. I’m crafty, not perfect. 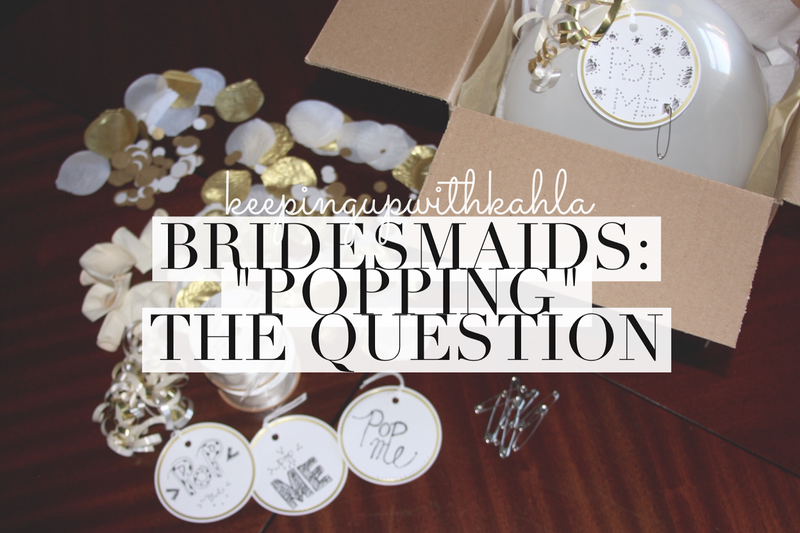 Stick a safety pin through each one of your “Pop Me” tags to give your future bridesmaid an instant balloon popping tool. FILL YOUR BALLOON! This step is easiest when done with two people (shouts to my fiancé!) while one is holding the balloon top open, and the other is stuffing. Fold up your notecard containing the question as small as you can and insert it into your un-inflated ballon. Next, stuff the balloon with your petals and confetti. Blow up your balloon and tie. Assembling the balloon. Tie your “pop me” tags to the bottom of your balloon on the stem. If you’re mailing this to someone, include their name tag and tie that on as well. After these are added, tie on the spiral ribbons. I bought a couple of ribbon bunches and then cut them in half to make sure I’d have enough for each balloon. Assemble your cardboard boxes. Follow the box assembly instructions, then stuff & fluff the inside with your tissue paper. I used 12×12 boxes, and they worked perfectly. Place your balloon bottom side up in the box. You’ll want the “Pop Me” tags, and spiral ribbon facing your future B-Maid when she opens the box. You know, so she’ll know what to do with it. Tie a bow around the outside of the box with the satin ribbon. Add the name tag for your bridesmaid, then leave it on her doorstep. Hide in their closet until you hear them pop the ballon. Confetti and petals will fly all over their dining room table along with your notecard. Wait until the recovery from the amazingness that just happened, and make sure you hear her read the notecard. Exit the closet to surprise them – all while being filmed on a Go-Pro. Or hand it to them. Or mail it them. All delivery options got me a big ole “YES”.